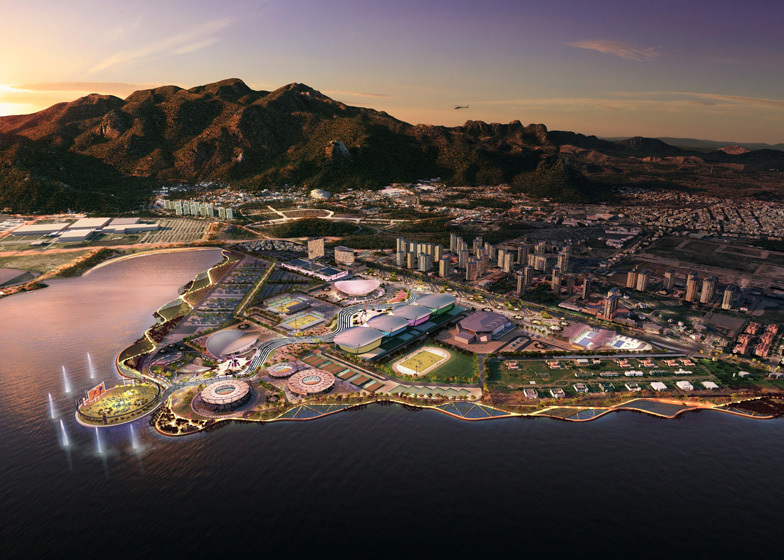 The setting for the 2016 Olympic Games in Rio will be a lagoon-side peninsula with 15 sports venues dotted along a network of snaking pathways, as detailed in this new set of visuals by masterplanners AECOM (+ slideshow). Located on a flat triangular site in the city's Barra da Tijuca district, the main Olympic park will centre itself around a trio of existing stadiums leftover from the 2007 Pan-American Games, which were constructed over a Formula One racetrack from the 1970s. 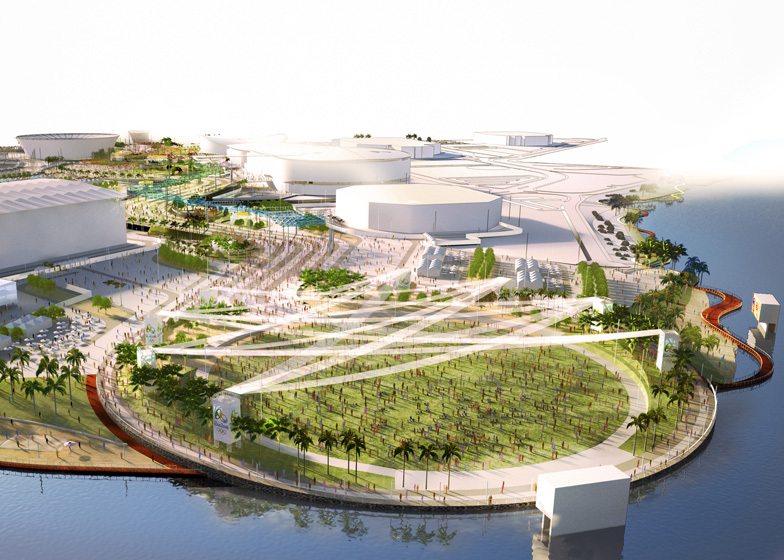 AECOM plans to transform the peninsula into a tropical landscape that reflects the mountains and valleys of the Brazilian coastline, including gently sloping hills and curving pathways. Venues will be lined up on either side of a black-and-white striped central axis, winding like a river from the site entrance to the waterfront. Seven new stadiums will be constructed on the site. London studio AndArchitects is collaborating with Rio office Lopes, Santos & Ferreira Gomes on the handball arena, which will be dismantled after the games and used to build four new schools. 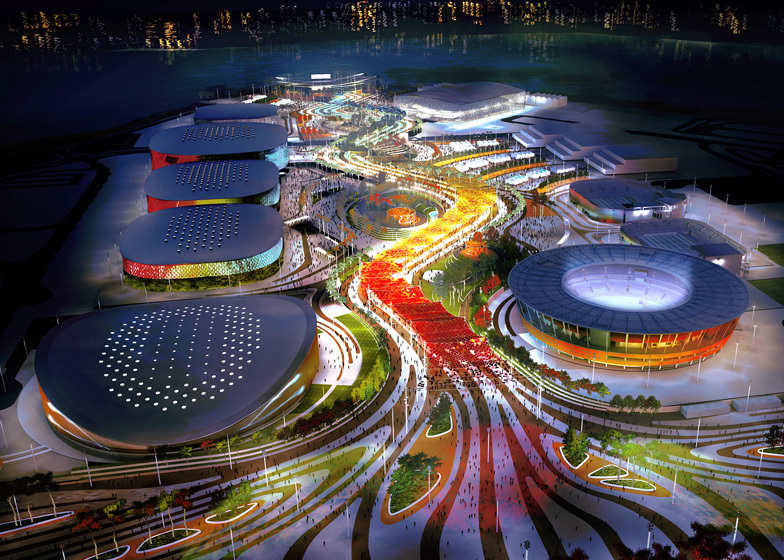 UK firm 3DReid is teaming up with Rio studio BLAC Architects to renovate the existing Velodrome, while the Maria Lenk Aquatic Centre will be reused for swimming and diving events, and the HSBC Stadium will host gymnastics. A waterfront lawn will allow up to 12,000 spectators to watch the action on big screens and an AECOM-designed broadcast centre will accommodate around 20,000 international journalists. AECOM won the bid to masterplan the site in 2011 as part of a team that includes London-based Wilkinson Eyre Architects and Rio studio DG Architecture. "This is such a high profile and complex project for AECOM, which brings many exciting opportunities and challenges," commented the firm's Jason Prior. 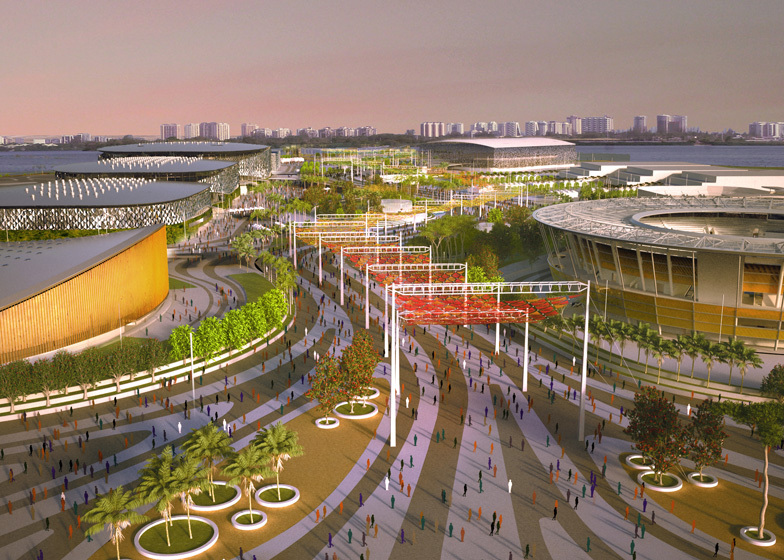 "We are drawing on our experience from being masterplanners of the London Olympics to take the design of the Rio venues and park even further, which will hopefully be reflected in the end result in 2016." Alongside Barra da Tijuca, events for the games will also take place at Copacabana, Maracanã and Deodoro, where the National Shooting Centre is already in place. 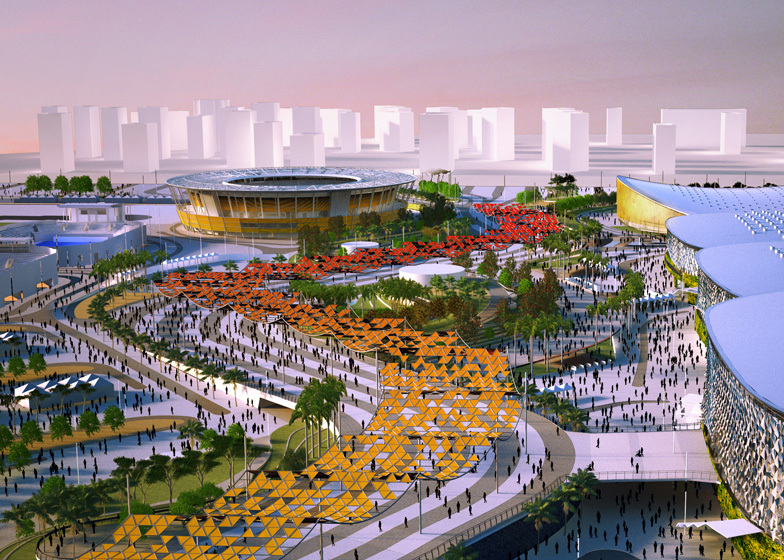 In 2011, AECOM won Brazil'fs first international architecture competition to design the masterplan for Rio's 2016 Olympic Park, making it the first company to design the parks for two consecutive Olympic and Paralympic Games Parks – London in 2012 and Rio in 2016. 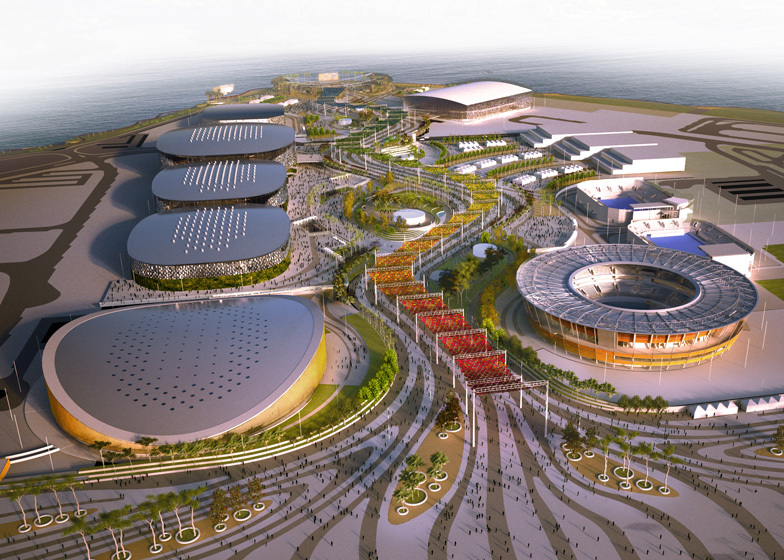 In Rio, AECOM has taken on an even larger role than it had on the 2012 Games, with responsibility for the preliminary design of the seven sporting venues as well as the detailed design of the International Broadcast Centre. This is in addition to the architectural, masterplanning, landscaping, engineering, cost consultancy, project management, sustainability and transportation strategy design services that it also provided in London. 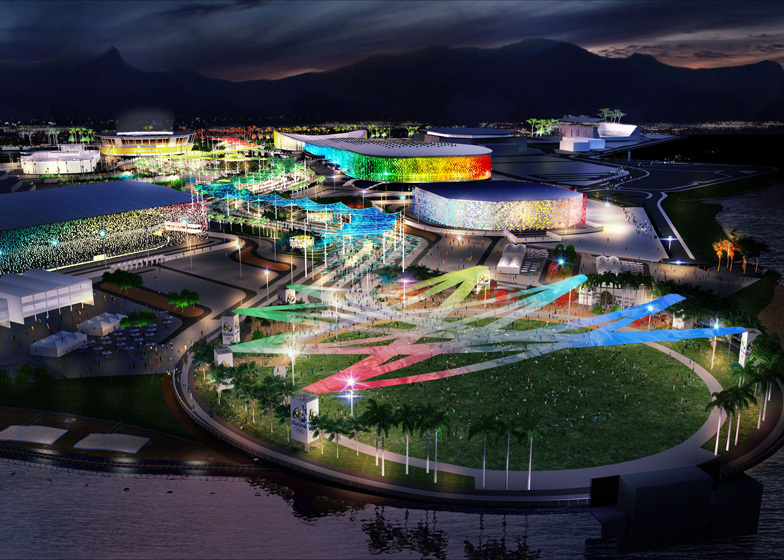 Set in one of the most beautiful areas on Earth, AECOM's masterplan takes its inspiration from the dramatic natural setting of Rio. Located on a former Formula 1 race track in Barra da Tijuca, the main Olympic park sits on a triangular space with water on either side. During Games time, at the southern peninsula of the site there will be an entertainment area for around 12,000 people to watch the events on big screens. The park's design draws from the Atlantica Forrest that surrounds Rio de Janeiro. This context provides the conceptual inspiration and influences the architecture and landscape design as will the Brazilian culture and strong design heritage. The masterplan sets out to respect and reinforce the balance between native ecology, the city and its people while delivering the platform for sporting excellence. Every Olympics needs to reflect the character and ambitions of the host city and this is where the differences between the two parks are most pronounced. While London was about demonstrating how a short global event can lead to the long term regeneration of one of the most neglected and deprived areas of the city, Rio is about celebrating Brazil's emergence as a world power as well as making sure there is a strong legacy plan in place. Throughout the development of the Rio masterplan, you can see how AECOM has been applying the lessons learnt from working on London 2012. This includes working with the wide range of stakeholders and local communities, and the utilisation of its knowledge of the requirements for running such a huge event, from crowd management and traffic strategies, to meeting the needs of athletes, visitors and the extended Olympic management and support system. The vision for the future is not just to create a global stage for the Olympic and Paralympic Games of 2016, but also, in the longer term, to create a new legacy district with new homes, jobs and places for leisure activities with a new central park and a thriving beautiful waterfront. It is also set to become a global centre of sporting excellence, with a Legacy Olympic Training Centre utilising the Games' permanent sporting venues. After the Games, the site will evolve into a compact urban environment built around a network of streets and open spaces, which encourages a diverse mix of living, working and recreational uses. AECOM has taken reference from the grid, linearity, axis and contrasting organic forms which permeates Rio's unique urban environment to propose a responsive flexible framework that resonates with and echoes the specific local characteristics of Barra and Rio. The masterplan provides an opportunity to enhance environmental quality and bring Costa's original concept into the 21st century as an example of new urbanism for a new era. For job opportunities at AECOM, visit their company profile on Dezeen Jobs.